*National Geographic voice* A flock of students enjoy the new delicious delicacies offered at the &amp;pizza and Milk Bar sneak peek. With all the shops and restaurants leaving the Square lately, &pizza and Milk Bar are some of the few shining new additions compared to a now deserted Urban Outfitters (R.I.P.). 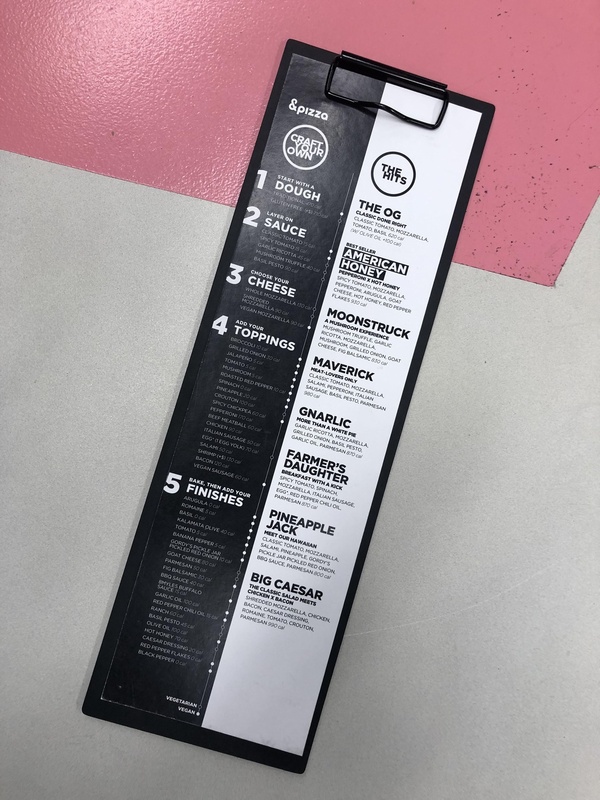 Located on Brattle Street right across from the Curious George store, this new restaurant and dessert stop combo is especially convenient for those of us living near the Yard. So, with the grand opening happening this Saturday, I got the chance to check out the Friends & Family Preview on Wednesday for a first look at this new combo store. With its fun, bright interior and windows all along the outside, this is great location to get away from the grey Cambridge winter while doing some Square people-watching. Anywhere inside could serve as the background for your next Insta post, and the lighting is perfect for taking some ~aesthetic~ foodie pictures. The music is bopping, the workers are friendly, and there’s seating for you and your squad, so really what more could you ask for? Plus, with Valentine’s Day coming up quick, this would be a great spot for a combined dinner and dessert date night (or the perfect place to eat lots of ice cream and act like that holiday doesn’t exist, your choice!). 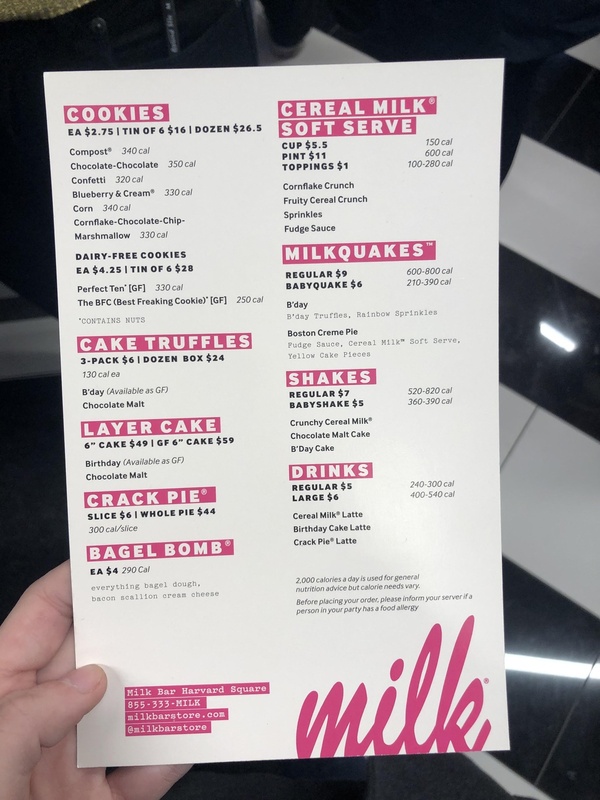 I tried three items at the Milk Bar: the Crack Pie, the Boston Creme Pie Milkquake, and the Corn Cookie. The highlight of my Milk Bar experience was, without a doubt, the Crack Pie (which makes sense considering it’s one of their most popular items). Imagine basically eating a full stick of butter with an oatmeal cookie, and you can start to understand the nearly religious experience I had while eating this. The Boston Creme Pie Milkquake is unique to this new location, and although it didn’t taste as heavenly as the Crack Pie, it’s a great option for pretending like it’s still 70 degrees and sunny outside. While I was undecided on a third sweet to try, one worker highly recommended the Corn Cookie, saying it tasted like cornbread (which was music to my Southern ears). Admittedly, I would compare it more to a sugar cookie with a heavy smell of corn but hey, if that’s your thing then this is perfect for you. Despite the downfalls of the Corn Cookie, I give Milk Bar a 7/10 — just make sure you come with a big sweet tooth. For my pizza taste testing, I got “The OG”, or your classic Margherita pizza. Each pizza can be customized to your liking with whatever sauces, cheeses, and toppings your heart desires, and you get to watch the whole (Instagrammable) process that only takes a few minutes. Depending on what you order, the pizza is definitely more on the minimalist side (aka, no gooey melted cheese to bite into), but with fresh ingredients and a great experience, earning an 8/10 from this pizza connoisseur. Overall, with some great flavor and a fun, cheerful vibe, I give Milk Bar and &pizza a good 8/10. With so many changes to the Square over winter break, both are great new additions for anyone wanting something savory or sweet. 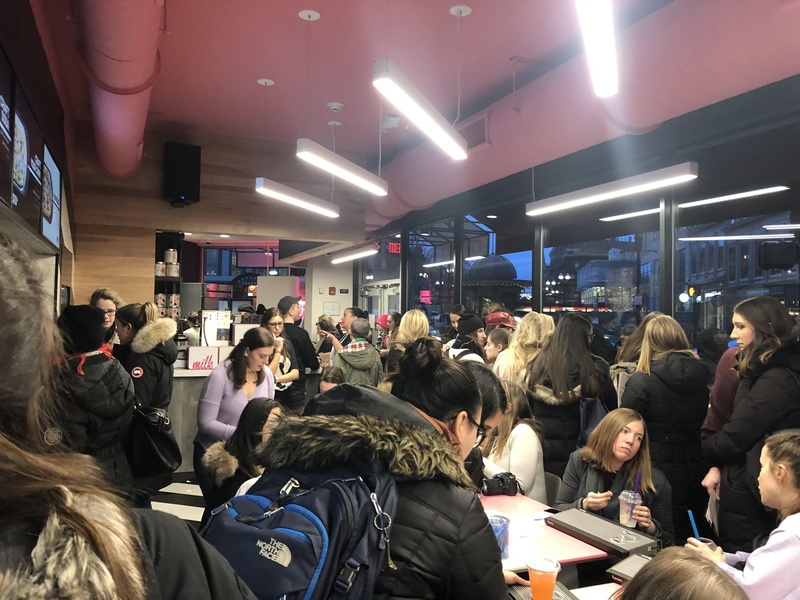 Plus, with them being open until 2:00 a.m. on the weekends, they make for a great late night spot besides Jefe’s or Tasty Burger – that is, if you’re willing to wait in what are sure to be long lines of students also eager to try them. Be sure to check out both restaurants when they open at 11:00am on Saturday for giveaways, samples, and sweet treats (one dollar soft serve! ).